The Nikon SB-700 is Nikon’s mid-tiered flash, in terms of size, overall features, and price. 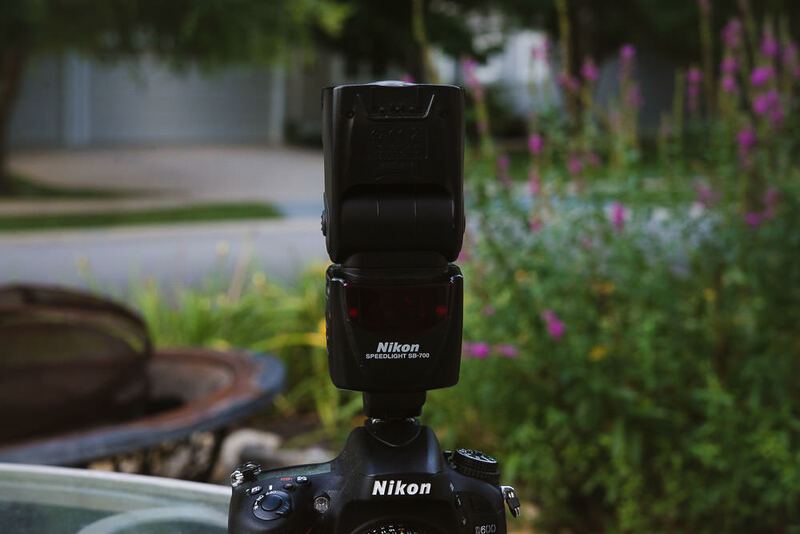 Nikon positions it as a flash for amateur photographers, but can be used professionally, albeit with maybe some added accessories. In terms of my own assessment of this flash, overall I do like it and have gotten a ton of use out of it but I do have major gripes about it. The Nikon SB-700 flash has a guide number of 28 meters, or 92 feet when set to ISO 100, 35mm zoom head position and shot in full frame format. This basically means that anything within that distance will be illuminated before significant falloff occurs. I’ve found that his is a reasonable amount of power for a flash of this size. It has slightly less power than the SB-910 (by about a third of a stop) and even has a bit less power than the SB-600, the flash that the SB-700 replaced. Regardless, the Nikon SB-700 still has plenty of power for a mobile hot shoe flash, and while having less power wouldn’t really ever be considered a good thing, it does result in other benefits. Namely, faster recycle times and less issues with the flash unit overheating from repeated use. In my experience this flash has provided more than enough power in indoor settings when I use it for portraits. The main use I have it for is wedding photography, reserved mostly for dance floor and reception shots. It does a great job as an on-camera flash bouncing into the ceiling or walls or on a monopod being carried by an assistant. But in the larger and darker venues it could be improved by a boost in power at times. The Nikon SB-700 is equipped with Nikon’s Creative Lighting System (CLS), which enables Nikon devices to communicate with each other. This allows them to do things like fire a flash remotely or get proper exposures. 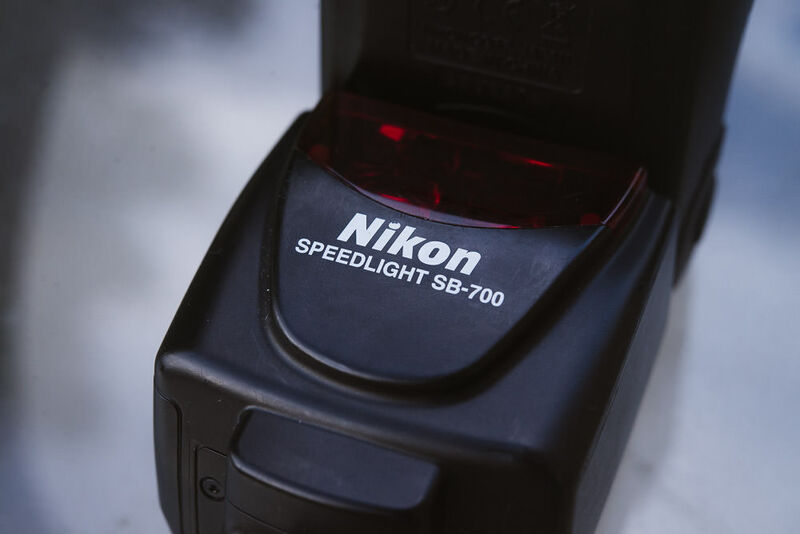 The SB-700 can be used as a commander to fire an unlimited number of Nikon speed lights, as long as they have CLS functionality. Speed light slaves are unlimited but are limited to two groups. The vast majority of the time, if I’m using flash, I prefer to dial everything in manually so I know exactly what I’m getting and it’s consistent. There are times, however, when using TTL just makes sense, for various reasons. If you haven’t heard of TTL before, it stands for Through The Lens and means that the camera takes a meter reading through the lens and the flash emits a flash of light in strength according to the meter reading taken. It’s not necessary to utilize the SB-700’s TTL capability. Some flashes are completely manual and you can get by just fine without it. It is nice to have TTL as an option though sometimes. Sometimes you may find yourself in a tricky lighting situation in which you can’t get the proper exposure. In a situation like this, you can use TTL for your exposures. Or you can even use TTL as a baseline exposure for your flash settings – you can take a picture in TTL mode, then go back and look at the data to see what flash power it was shot at and then adjust from there to dial it in to how you want it. TTL is also great for lighting conditions that change frequently. If you’re in a setting where the light is going to pretty much be consistent from shot to shot and from different angles, then I prefer shooting in manual because that way I get the light dialed in just the way I want it and it stays consistent. But I don’t want to be fiddling with settings constantly so in those cases in which the lighting wouldn’t be consistent if you left the flash power as is, TTL works great. A trick that took me a while to figure out is using TTL in conjunction with a long focal length and bouncing the flash laterally off a nearby wall. This is something I do when photographing weddings or events. This creates a really beautiful soft light. It’s really hard to gauge what flash power to use in these situations, and TTL does a good job of getting exposures. Keep in mind the effect of using this technique only works when using a longer focal length lens; use a 35mm and wider and you get extreme falloff on the side of the frame opposite to which you bounced the flash. Let’s not forget that we all get lazy from time to time too – and TTL can get us an approximate, if not perfect exposure. It’s also nice being able to use TTL with exposure compensation. If you take an exposure with TTL and it’s off by a third stop or whatever, you can compensate for that by using the exposure compensation controls on the camera. Due to this being a flash made for use with DSLR cameras, you will be limited in shutter speed, with a maximum of 1/200s. This is a pretty big disadvantage compared to what you can do with mirrorless cameras. Because mirrorless cameras usually have electronic leaf shutters, they are compatible with flashes up to a much faster shutter speeds. Most Nikon DSLRs will be limited to shooting at 1/200s with high speed sync enabled, but some cameras can go up to 1/320s. Exposures taken at shutter speed values faster than this will result in unusable photos with black bands across a side of the frame. The Nikon SB-700 has a decent enough interface, one which is a slight improvement over the SB-600 in my opinion. The difference as far as I can tell is minor, just that in this version the screen is slightly larger and everything is slightly more legible. At the top left of the screen the unit displays which mode it’s in and under that it displays the flash power. 1/1 being the strongest and 1/128th being the weakest. In the bottom left corner you have a display showing you the degree that the flash beam is set to. This is adjustable and allows you to constrict or expand the beam of light that comes out of the flash. If you’re using a 35mm lens it’s a good idea to have the flash set accordingly to 35mm, but is just a general guideline and you can use any of the flash zoom settings to get the look you’re after. On the left side of the display there’s a temperature gauge. It’s good to have a visual of where the flash is at in terms of temperature but at the same time the flash has an automatic shutoff function to keep the flash from overheating so the flash is going to protect itself whether you want it to or not. One of the cons of the uber-expensive SB-900 flash that came out before the SB-700 was that it had a notoriously sensitive barrier to getting to the point where the flash would turn off to protect itself from overheating. This meant that the flash would just turn itself off after reaching a certain temperature threshold and you were left with a big and heavy flash just weighing down your already heavy DSLR setup. 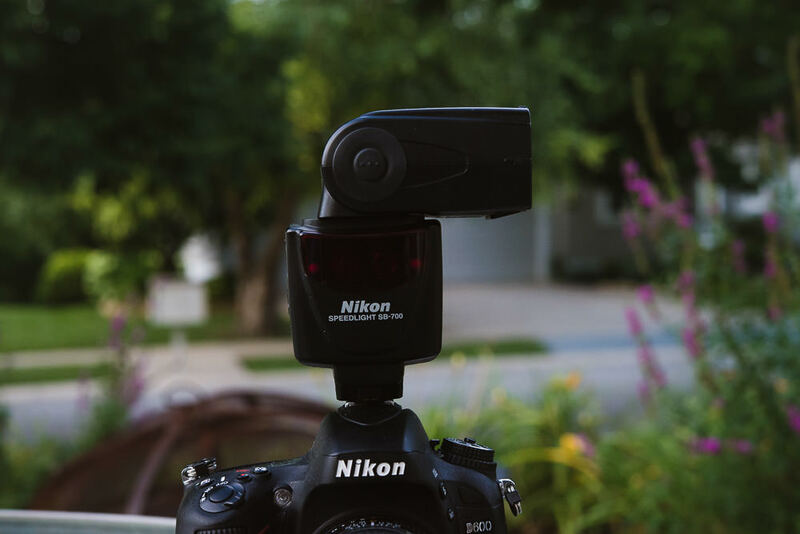 Nikon did come out with a firmware update to address this to make it so that there would be a higher threshold for the flash to get to the point of shutting off. You could also disable the flash from shutting itself off altogether, but then you run the risk of burning out your flash. And considering the fact that catching your clients’ wedding venue on fire is probably not the best tactic for acquiring new customers in the future, it’s probably best to keep your flash intact and not blowing up or catching on fire. While it can be annoying when the SB-700 doesn’t fire as its temperature is regulated to keep it from overheating, I’ll take that if the alternative is having the flash destroy itself. I do however find it to be a problem at times, mostly during wedding receptions while shooting on the dancefloor. In these situations I’m often firing my flash continuously and being hampered by a flash overheating is a huge hindrance. I’ve missed potentially great shots because of this. I certainly don’t have all the answers but it seems to me technology needs to be developed to drastically reduce the heating of flash units or a new type of light should be used in hot shoe flashes. The Nikon SB-700 is able to act as a commander and make other flashes fire. 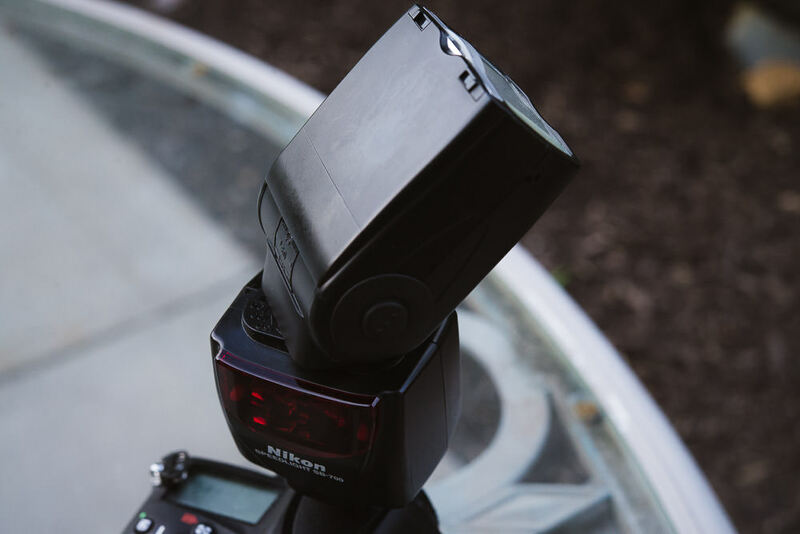 This is the cheapest and most basic way to fire multiple flashes. Once you get more experienced with using multiple flashes in a studio setting, most photographers move up to shooting with more reliable radio-based flash triggers, but having a commander mode is good and almost necessary for a couple reasons. Shooting in commander mode is a good way to get your feet wet in off-camera flash. You don’t need any extra expensive equipment and it’s easy – you just make sure your commander flash unit is communicating with the other flashes you have set up and fire away. It’s also a good backup to have if anything should go wrong (and stuff always seems to go wrong) with any other off-camera flash setup you use, whether it’s wired or you’re using radio triggers. The Nikon SB-700 has a 2.5 second recycle time, a one second improvement over the the SB-600. 2.5 seconds isn’t a bad recycle time, but I’d like to see that improved in future Nikon flashes. It’s never a problem in controlled situations; you always have time to wait a moment for a flash to recycle when you’re shooting in a studio. But when it becomes an issue for me is at wedding receptions when I might want to fire off several consecutive exposures. In those cases it can border on too slow. I can also see it potentially being a slight hindrance for concert photographers as well. The Nikon SB-700 comes with a semi-clear plastic diffuser built into the unit. Honestly I never use these things and don’t think they really do anything other than decrease the power of the flash when used. I really don’t see the need for manufacturers to include these things. One included feature that I do find useful is the little white bounce card tucked into the flash head that you can pull in and out. This is the type of thing that I use only in emergency situations but it’s very good to have there. I’m at an outdoor reception with no walls or ceilings to bounce light off of on a night that I don’t have an assistant with me to carry an off-camera flash stick for me. What do you do in that situation, just shoot direct flash into your poor, unsuspecting subjects who paid you thousands of dollars to shoot their wedding? What I do just keep my flash pointed directly up like you would if you were bouncing off a ceiling but also with this little bounce card pulled out. 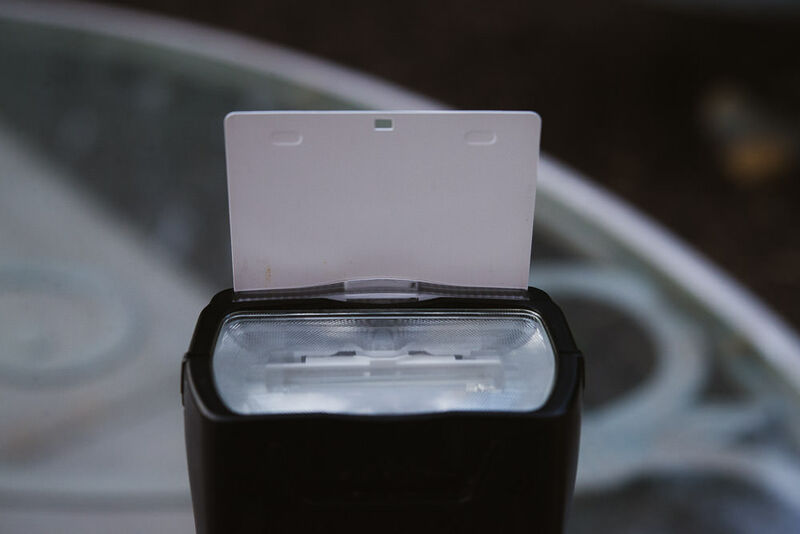 The bounce card keeps light from spreading behind the flash and directs it slightly forward. This technique is by no means perfect but it makes for far softer light that you would get if you just directed the flash head straight forward. The SB-700 feels very solidly constructed, no complaints in this department. Even the battery door which are notorious weak spots on hot shoe flashes, feels plenty strong and secure. 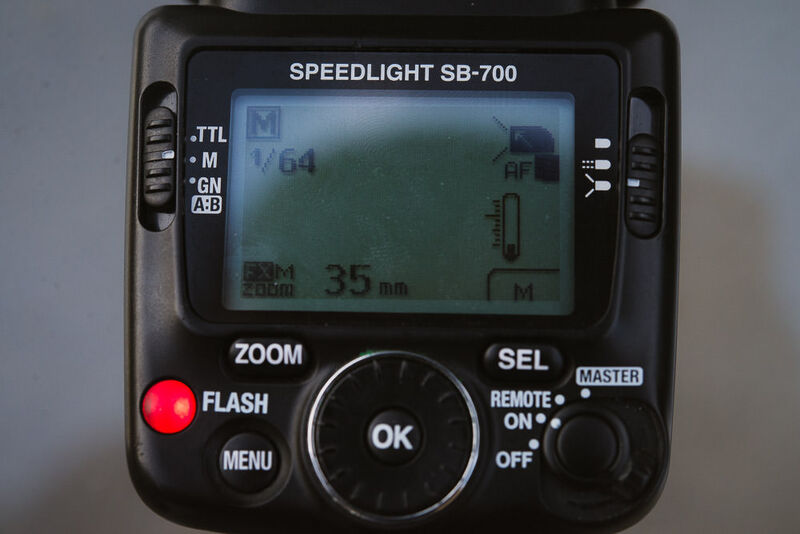 The SB-700 weighs 12.7 ounces, or just around .8 pounds. The dimensions are 2.8 x 5.0 x 4.1 inches. While that may not sound substantial on paper, make no mistake about it, this is a bulky size and weight for an accessory you put on top of your camera. DSLRs are already big and heavy, which becomes more noticeable after a long day of having it around your neck/shoulder, and adding a flash of this size and weight adds considerably to that burden. With DSLRs the size and weight issue really does just come with the territory and you just have to deal with it. The best you can really do is make sure you have a comfortable strap and take your camera from off your shoulders periodically if you’re shooting for an entire day. While it would be nice to have this flash be more compact and lighter, reducing it in size would probably mean a reduction in flash power as well. Getting your flash completely off-camera works so well because it allows you to get a much more flattering directional light. It works great for dancefloor shots at wedding receptions if you have an assistant hold a hot shoe flash on a monopod at a 45 degree angle from you. Tilting the flash head and bouncing the light into a ceiling or walls is the next best thing and can produce great results as well. When bouncing flash you’re essentially turning the surface you’re bouncing off of into a big soft box. This spreads the light out, making the light source larger, which gives you a softer light and more flattering look. To do that with the SB-700, you’ll need additional radio triggers. No PC Sync Port – WTF?! The biggest gripe I have about the Nikon SB-700 is the lack of sync port for use with radio triggers like standard Pocket Wizards. So if you want to get this flash off-camera, you either need to buy an additional adapter, or what Nikon would prefer, you buy their more expensive SB-900. This is just such an obvious decision by Nikon to keep the SB-900 as their “professional” flash model and anything under it “amateur”… because pros need the sync port, right? Nikon is withholding adding a very simple port so that the photographers who need it are forced into shelling out a couple hundred bucks more for the pro model. It would be easy to add a port to the SB-700, but that wasn’t part of Nikon’s strategy with this product apparently. Meanwhile there are third party manufacturers with flashes that have the port and are a third of the price (although you may find yourself with a dud as their quality control is hit or miss). 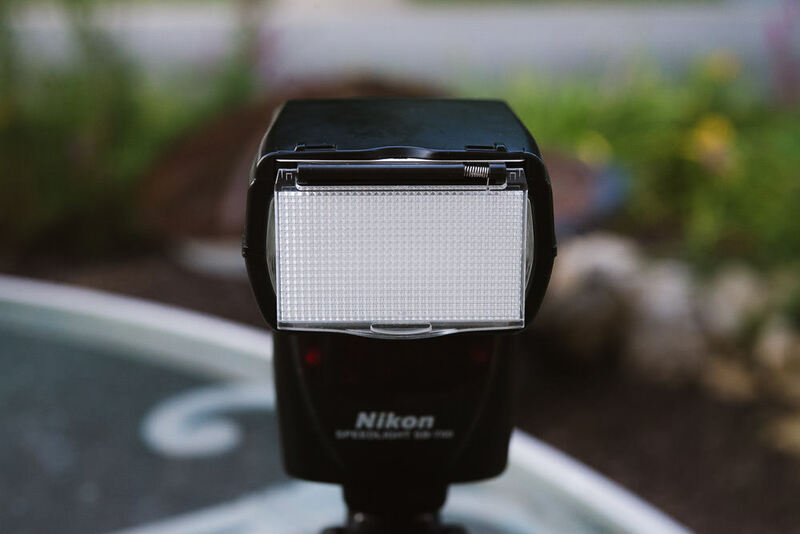 While there are several workarounds to the issue of the SB-700 not having a port that it should have, they’re just a hassle that you shouldn’t have to go through. 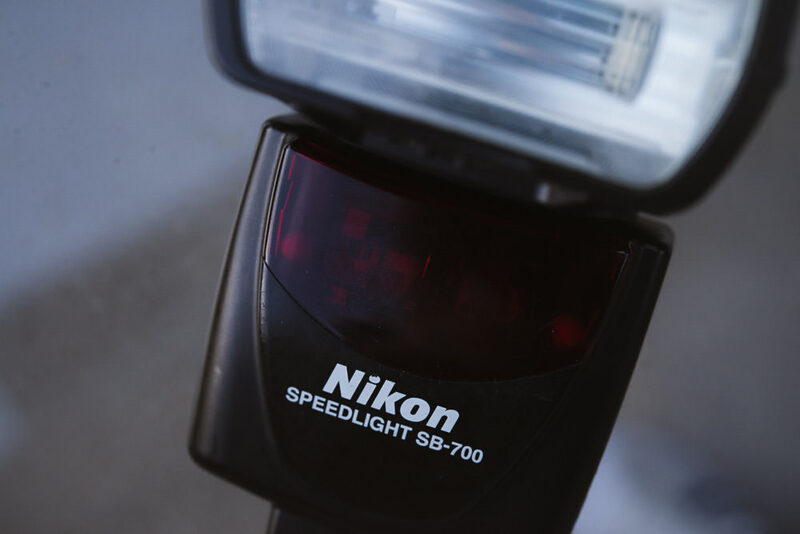 The Nikon SB-700 is a solid, dependable flash. I do recommend it but I think there are many third party options out there that suit a lot of photographer’s needs just as well as this flash. The only issue with going third party for a flash is their lack of quality control and they usually don’t have very good warranties. In the end, a flash is a very simple tool—all any flash truly does is provide you with a quick flash of bright, white light. The Nikon SB-700 certainly does do that but I’d say this is a very expensive flash considering the features that Nikon left out of it.